Mix cake mix (less reserved cup), butter and egg together and spread into a greased 9 x 13-inch pan. 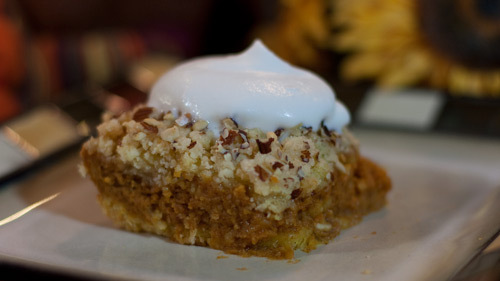 Mix the pumpkin, milk, eggs, brown sugar, cinnamon, sugar and nutmeg ingredients together and spread over the cake mixture. Mix reserved cake mix, flour, baking powder and sugar. Cut in butter, and sprinkle over cake. Next sprinkle top of cake with nuts. Bake at 350° for 50 minutes. Serve with whipped cream.